The Trustees are the governing body of the Army Families Federation. Their role is to ensure that the Army Families Federation succeeds in its core business of being the voice of the Army family. The Board of Trustees has the legal responsibility for the overall management, decision-making and performance of the Charity. The role of the Trustee is voluntary and unpaid. The Trustees bring a wide range of skills and experience to the Army Families Federation. The Board consists of a Chair of Trustees and Trustees. Julia is Group HR Director at Trinity Mirror. Previously, Julia worked at Serco where her role involved her in many of the Defence sites and working with the business and the MOD on the introduction of the Corporate Covenant. Prior to Serco, she was with Thomson Reuters where, in her role as Global HR Director, she supported global sales and service groups, editorial, media and corporate centre functions in over 125 countries. In this role, Julia led major global transformation of the front line workforces in both sales and customer service groups. Julia started her business career as a graduate trainee with the John Lewis Partnership, and took her first HR role following a number of retail management positions. After leading the HR function through a period of recession and change, she moved onto one of the leading HR consultancies. Here she headed up the HR function as well as consulting across a number of sectors, including education. Julia joined the AFF Board in October 2014, joining the British Chamber of Commerce as a Non-Executive Director shortly after in November 2014. Prior to taking these formal roles, Julia worked with many organisations on a voluntary basis to help with HR related issues. It is a combination of professional and business experience that she hopes is valuable to AFF. She is also hopeful that a working knowledge of the Defence space, and the fact that she isn’t an Army wife, brings a different perspective. Julia is married to Paul, and has two boys, James and Edward. Robin served in the Army in the Intelligence Corps, with an attachment to 3rd Battalion, The Royal Anglian Regiment. He married an Army daughter and together they enjoyed accompanied postings to Germany, Northern Ireland and GB plus an exciting family posting to Fort Huachuca, Arizona, USA. Whilst commanding his unit, Robin and Marianne (who was very much involved with the setting up of the initial Families Federation (FAWC)), were fully committed to all aspects of the welfare of Army families at both Loughborough and Cheltenham. This was during a challenging time, when the aspirations of the Families Federation were being more formally established. Since retiring, Robin has become a volunteer with Help for Heroes, working especially on strategic funding. Robin also serves as a Trustee of Home-Start (Kennet), which covers the busy Garrison towns in the Salisbury Plain area. Robin was invited to join the AFF Trustee Board in September 2013 having completed 13 years as the Secretary of the Army Central Fund (ACF), the largest charity in support of the serving Army, its families and dependants. During his time with ACF, Robin worked closely with funding for AFF on an annual basis. As Secretary ACF, Robin has extensive experience working to a Trustee Board, together with a full understanding of a charity’s financial and governance responsibilities, and is pleased to offer this advice and guidance to the AFF Board. Having served for over 30 years, including two unaccompanied tours as a Reservist (with six months in Bosnia), he can also bring a degree of military understanding. Fiona Ellison is the #iwill Fund Development Manager at the Big Lottery Fund, on secondment from Step Up To Serve, the charity that runs the #iwill Campaign. She is responsible for developing the #iwill Fund, a £40million investment from Government and Big Lottery Fund to develop social action opportunities for young people across the UK. Fiona has been involved in a number of initiatives across the voluntary sector. From developing the Young Achievers Awards; to supporting the development of a ground-breaking programme of work at the National Union of Students, on student opportunities engagement; to most recently at GoThinkBig, developing work experience opportunities for young people. She was on the board of Volunteering England, before they merged into NCVO, for 6 years. Fiona brings a broad knowledge of the voluntary sector to the AFF Trustee board; she has a strong grounding in board processes, good governance and strategic planning. In addition Fiona supports the AFF team with volunteering management and development. Fiona joined the AFF board in February 2016. She married into the Army in 2010 and currently lives in Sandhurst. Heather qualified as a lawyer in a private practice in London and since qualifying has worked as an in-house company/commercial lawyer for over 18 years at various companies including Cape Plc and Interserve Plc. At Interserve, she held the role of Member Nominated Trustee on the Pension board and held the positions of Director and Interim Chair on the Interserve Charity, IEF. Heather joined Serco in March 2017 as Head of Legal and Contracts Services, based in Hook. Her passion is diversity and she was privileged at her previous company to have been a founder of the Women’s Network, and linked with many leading companies and allies across the diversity network in the UK. At Serco Heather is supporting the already-developed ‘Serco Inspiring Women’ group and is assisting in enabling the LGBT community establish a new network. Heather lives in Reading, UK, with her husband, daughter and son. In her spare time she chauffeurs her children to ballroom dancing competitions and music performances. Catharine has been an Army spouse for 28 years and although the mobile military lifestyle isn’t the most conducive to having a career, she has always found work – albeit sometimes voluntary. 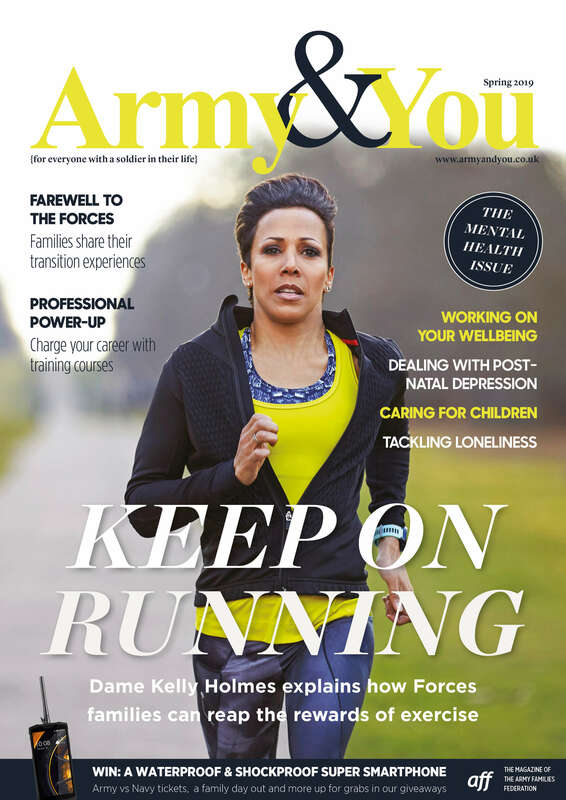 After several jobs (including a spell as an AFF volunteer in 1995), Catharine began working for AFF as Deputy Editor of the Families’ Journal (now Army & You) and later took on the Editor role. A key achievement during her tenure was to get the Families’ Journal delivered direct to families living in Service Family Accommodation (SFA) in GB; this was a big step forward in enabling AFF to communicate direct with its audience. Catharine currently works from home as a self-employed graphic designer and editor and is a partner at ETHOS – a consultancy formed from executives, professional practitioners and public servants who come together to resolve complex problems and set up innovative operations and organisations. Catharine has been an AFF Trustee since 2013 and is committed to ensuring that families are not disadvantaged due to their military lifestyle. Catharine also supports two other military related charities, sitting on the Executive Committee of the Army Winter Sports Association and working part-time for Team Army, a charity which raises funds for Forces sport. As Catharine is still ‘living the dream’ she brings a depth of knowledge of dependants’ expectations and issues, and of the military system, to the AFF Board. Catharine and her husband have lived in Hong Kong, Germany and Northern Ireland and currently live in their 15th ‘quarter’ in Varese. They have two adult sons, who both attended several schools before they went to boarding school. Julie was a serving Regular Army officer for 18 years and in-between sunshine postings to Bulford, Preston, Shrivenham, Windsor, Worthy Down, Corsham, Warminster and Colerne, she deployed to Bosnia and Northern Ireland. Her last few postings were sometimes accompanied (her husband was also serving), though more often than not she found herself unaccompanied and during this time they also raised a young family. After retiring in 2010 and enjoying a year at home with the family, Julie joined the Reserves and is thoroughly enjoying a second career working part-time, balancing her professional and domestic life with a bit less chaos than before. Julie has been a Trustee since 2015 and, as a seasoned staff officer with a broad knowledge and understanding of Army policy – together with HR, accounting and information systems skills, Julie helps to contribute as a Trustee on the interpretation of policy, particularly in the HR arena.